WASHINGTON — President Donald Trump fired his embattled Veterans Affairs secretary Wednesday and tapped as his replacement atop the chronically mismanaged agency the president’s personal physician, who gained prominence with his effusive praise of the 71-year-old’s physical and mental health. 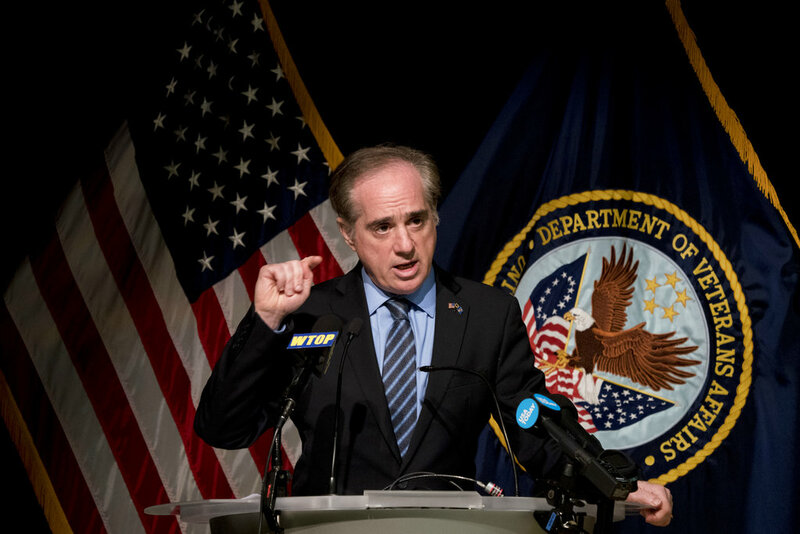 The ouster of Veterans Affairs Secretary David Shulkin, who has been mired in scandal over his charging taxpayers for luxury travel expenses and the infighting among his senior aides, had been widely expected and was made official at 5:31 p.m. by presidential tweet. Trump said he would nominate Ronny Jackson, 50, an active-duty rear admiral in the Navy who has served for the past three administrations as a White House physician. A biography released by the White House shows Jackson is credentialed and experienced in medicine but has no background in management. He nonetheless will be charged with delivering on one of Trump’s signature campaign promises: to fix the federal government’s second-largest bureaucracy. VA, which employs 360,000 people and has a $186 billion annual budget, serves a growing population of veterans in need and is suffering from a shortage of doctors, nurses and mental-health experts. As a career military officer, Jackson has been apolitical, and his views on a range of hot-button issues affecting VA – including proposals to privatize care – are not publicly known. At a time when Trump’s critics questioned his mental fitness, based in part on accounts in the book “Fire and Fury,” Jackson effectively backed up Trump’s claims of being a “very stable genius,” telling reporters that he received a perfect score on a cognitive exam. Some Republican senators issued muted statements saying they looked forward to learning more about Jackson. Privately, there was speculation that he lacks the management chops to oversee VA, according to a Senate Republican aide who spoke on the condition of anonymity to talk candidly. The firing of Shulkin, who was the sole Obama-era holdover in Trump’s Cabinet, is the latest tremor in a broad shake-up of Trump’s administration. In March alone, the president has replaced his secretary of state, national security adviser and top economic adviser and is planning to soon name a new White House communications director. Shulkin did not immediately respond to a request for comment. As Jackson awaits Senate confirmation, the acting VA secretary will be Robert Wilkie, who serves as undersecretary of defense for personnel and readiness, focused on such areas as health, welfare and quality of life. Jackson does not have a political background or experience working with Trump before the president took office. Born in Texas, Jackson studied marine biology, graduated from medical school and joined the Navy in 1995. He spent time leading an emergency medical unit in Iraq. Jackson began work as a White House physician in the mid-2000s and was named the top presidential physician in 2013, serving as President Barack Obama’s doctor and then Trump’s, but remained an active-duty Navy officer. Jackson intends to remain in the Navy until he is confirmed as VA secretary and then plans to resign before taking the oath of office, a White House official said. Jackson was considered a “wild card” choice for VA secretary, according to a White House official. Media speculation centered on Pete Hegseth, a Fox News Channel personality who has informally advised Trump on veterans issues, but Trump had his eye on Jackson. Last weekend at Mar-a-Lago, the president’s private estate in Palm Beach, Florida, Trump asked friends whether Jackson would be a good choice to run VA and then on Monday asked some of his White House aides, senior officials said. One person who heard Trump mention Jackson’s name for the post was not sure whether the president was serious. Jackson, who is referred to inside the West Wing as “Dr. Ronny,” travels regularly with Trump, and the men have developed a bond. Jackson checks in on the president at least once a day, and the doctor is usually in the White House residence with him. Jackson jokes around with Trump, which the president likes, and Trump often tells friends how smart Jackson is, officials said. “I love the guy!” Trump often says of Jackson, officials said. Jackson is a behind-the-scenes figure but gained notice Jan. 16 when he held a news conference to answer questions about Trump’s physical, which he had personally administered at Walter Reed National Military Medical Center. He described Trump as in excellent health, putting his weight at 239 pounds, just one pound below the obesity level for a man of Trump’s height, 6-foot-3. Jackson said that Trump’s blood pressure and resting heart rate were in the normal range and that Trump showed an above-average exercise capacity despite his declared aversion to physical activity other than golf. But he noted Trump’s elevated cholesterol level and poor diet and said a reasonable goal was to lose 10 to 15 pounds over the next year. At the White House and aboard Air Force One, Trump has asked Jackson about contracting issues at VA and how he might fix problems in the agency, according to a senior White House official. Trump had even asked Jackson what he thought of Shulkin, an official said. The two doctors are close friends who met during the Obama administration, when Shulkin ran the Veterans Health Administration and Jackson served as Obama’s doctor. It was unclear how Jackson replied to the president. At one point last year, Shulkin recommended Jackson for a senior role at VA, and initial vetting was done, but Jackson was not interested in leaving the White House at that point, according to a senior official. In the early months of Trump’s administration, Shulkin was one of the president’s favorite Cabinet secretaries, in part because he was seen as advancing one of Trump’s key campaign promises, improving veterans’ care. But months of bad headlines about infighting at VA and profligate spending by the secretary frustrated Trump. And a steady drumbeat of senior officials – including White House Chief of Staff John Kelly – told Trump that Shulkin had been dishonest in his dealings with West Wing officials. A recent inspector general report criticizing Shulkin’s trip to Europe last summer proved too damaging. Kelly called Shulkin on Wednesday afternoon and told him he was losing his job, a White House official said. “It was just a courtesy. Thanks for your service,” this person said, describing the call. Among Shulkin’s failures, in the White House’s estimation, was his moderate position on allowing veterans more access to private doctors outside the VA system. About 30 percent of veterans see private doctors outside VA, but the president and his supporters, particularly an increasingly influential veterans group backed by the billionaire industrialists Charles and David Koch, are pushing for more private care. The issue is controversial, though, pitting the White House against traditional veterans groups who fear a privatized system that would drain resources from the government. It is sure to be the biggest question Jackson will face during the Senate confirmation process. Sen. Bernie Sanders, I-Vt., who serves on the Senate Veterans’ Affairs Committee, cautioned that any nominee who is in favor of too much private care would not be cleared by the committee. Shulkin’s record as secretary is mixed. He delivered legislative victories for Trump during his first year, from a bill that clears a fast path to firing employees accused of misconduct to measures aimed at easing the backlog of benefit appeals. He oversaw creation of a 24-hour hotline for veteran complaints and improved transparency, posting wait times for medical appointments at each facility and other quality-control measures consistent with many private-sector hospitals. But Shulkin struggled to connect with the president’s allies. The Washington Post’s Lenny Bernstein contributed to this report.